Are these fleurs on fire burning to be in your bouquet? A bride’s bouquet is extremely personal. This is the one traditional accessory that every girl dreams about. Often times, these flowers make up a majority of the entire floral design scheme, so choosing the ones that you are passionate about is best. Plus you’ll forever be cherishing those photographs with you holding this botanical masterpiece. Some like it HAUTE… like this hearts aflame bouquet in sun-kissed hues. Varieties of flowers make up this European hand-tied bouquet with tulips, calla lilies, roses and gloriosa lilies as the focal flowers. These are not just any ordinary flowers but specifically chosen breeds to suit this bride’s bright and vivacious style. Orange gold-tipped parrot tulips mixed with vivid mambo sweetheart rosebuds in varying stages of bloom comprise the majority of the bouquet with scampering red gloriosa and scattered flame calla lilies bursting in contrast. A bouquet in this orange-red color combination can be hard to achieve, but I am just in love with the freshness of this style that focuses on shape and textural elements. What lovely fleurs do you want in your bridal bouquet? This dreamy bouquet is comprised of softly ruffled Carmel Antik garden roses in butter cream, coupled with the perfect proportion of white Patience garden roses and Amnesia roses, lending a vintage lavender hue. A variety of ranunculus and delicate handpicked gardenias add texture amongst the focal flowers, while subtle hints of tulips, lisianthus, and dusty miller complete the arrangement. 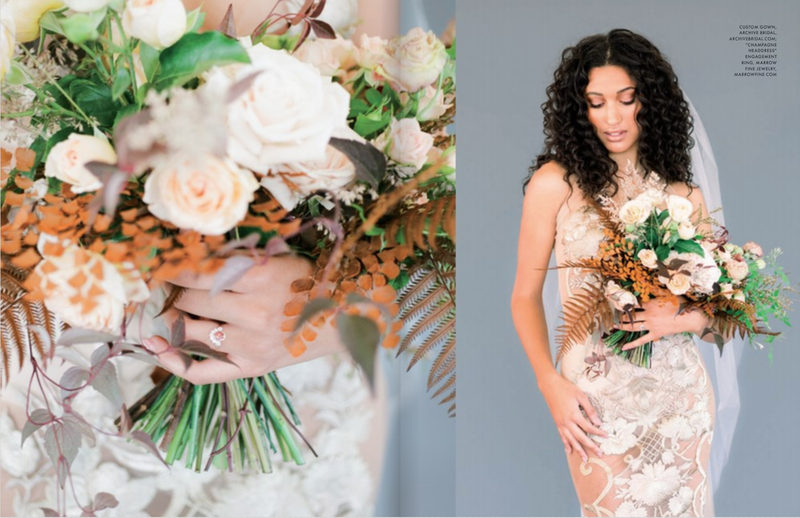 This hand-tied bouquet has stems partially exposed for a natural presentation, keeping the romance alive yet not detracting from the real focus – the beautiful bride.